As a mobile locksmith, we come to you. We’re fast, and we’re available from 8am – 12am. We specialize in the making the keys that you need for your bike’s ignition, and we can duplicate the keys for every model — Harley Davidson, BMW, Honda, Kawasaki, Ducati, Vespa, you name it. Key replacement for almost all models of motorcycles and scooters. All the locks you need for your motorcycle: security locks, fork locks, padlocks, disc brake locks, and seat locks. We repair broken motorcycle ignition locks. We’ll pop a lock if you need it, and we can remove that broken motorcycle key from your ignition lock. 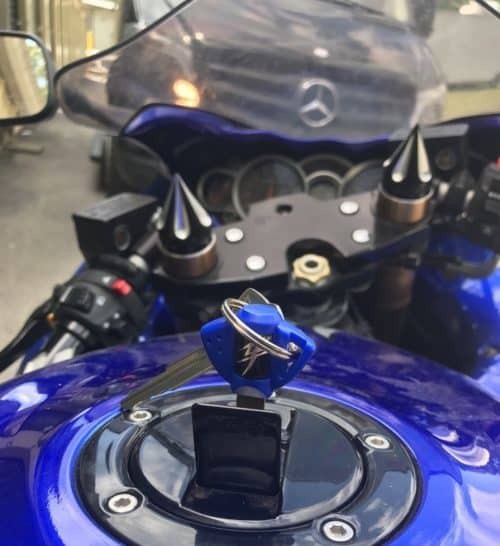 Locking gas caps for your motorcycle. And just for the record, we’re an automotive locksmith as well when your cars need a little hand with security. We’ve done all the hard work to make sure you can feel secure. You can count on us for honest and transparent pricing that compares well to all our competitors. We pride ourselves on providing fast service. When you’re stuck by the side of the road and you just can’t figure out what happened to your keys, or you’re holding a broken ignition key in your hand and wondering what to do next, you don’t want to hear it’ll be a few hours till someone can help you. Or worse — call back during daytime hours. You won’t have to worry about that with us. We are mobile, and we are on call from 8am-12am every day. Imagine walking out to your parked bike to find the ignition scratched, dented, vandalized as a result of attempted theft. We’ll be there to fix it pronto — and we can rekey your ignition and locks if your keys are stolen. We are experts about enhancing your motorcycle’s security. At Lock Dawg we’re locally owned and part of your community. We are committed to getting you back on the road safely and promptly. When you need a motorcycle locksmith in central Georgia, we’re the ones to call. Let us know what you need, and our mobile locksmith unit will be there right away to help. When you need a locksmith in and around Hoschton, GA, you can count on Lock Dawg every time. Established in 1994, Lock Dawg locksmith service provides local and highly skilled key duplication, lock repair, car key replacement and more. You can be sure that your vehicle, home, and business lock needs will be handled quickly and professionally.